Shopping hours: Monday - Saturday: 10 a.m. - 9 p.m.; Sunday: 10 a.m. - 8 p.m. Dining & Bar hours: Sunday - Thursday: 11 a.m. - 11 p.m.; Saturday: 11 a.m. - 1 a.m. 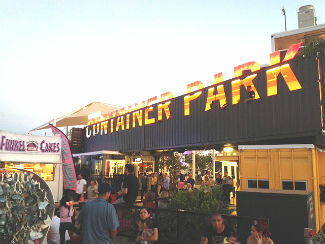 Downtown Container Park has brought new meaning behind the idea of sustainability in a Las Vegas attraction. True to its name, the exterior of this 19,000-square-foot multi-use area was constructed from stacked shipping containers and modular cubes. Everything from the bridge above the entrance to the three-story elevator was made from recycled metal containers. The result is an attraction with a unique industrial design. Located near the eastern end of the Fremont East Entertainment District, Downtown Container Park more than just a high-concept outdoor shopping mall. Not only is it one of the few family-friendly places in the district, Container Park is a great place to shop, dine, sip wine, watch concerts or just kill time. 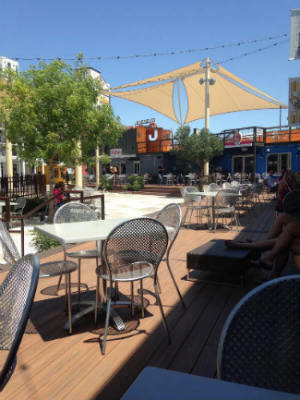 Opened in 2013, Container Park was spearheaded by the Downtown Project, a non profit initiative that aims to help revitalize Downtown Las Vegas. The concept of recycling shipping containers for construction is not new — it has been done in San Francisco, New York and London. However, the Downtown Project has sought to make Las Vegas the shipping container capital of the world. In total, Container Park uses 30 shipping containers and 41 modular cubes, all of which can be repurposed if they are ever dismantled. These 250-square-foot cubes have been cut, stacked and conjoined in unique ways to create shopping spaces. The park entrance is marked by one of the most eye-catching statues in all of Downtown Las Vegas — a 55-foot mantis. 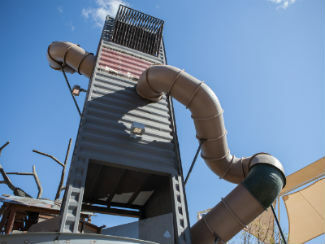 This metal mobile art piece is 40 feet long and sits atop a dumpster. 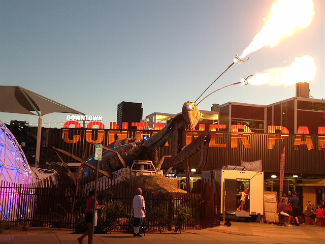 As guests arrive at the entrance area, the mantis randomly shoots flames from its antennas, producing a noticeable blast of heat and light. Reactions among passers-by range from awe to pure shock. Right next to the mantis is another interesting art piece called the Catalyst Dome. The dome changes color via a lighting system from within. Container Park features 25 shops and 12 food/drink options on three levels. Most of the establishments operate out of one of the 250-square-foot cubes within the park. This makes for interiors that can sometimes be quite cozy. Thankfully, there’s plenty of outdoor seating available. Since Container Park is relatively new, many businesses have moved in and out. All of the businesses at the park are owner operated rather than chains or franchises. Food options range from dessert and snack shops to trendy eateries. Big Ern’s BBQ and Pinches Tacos are popular for lunch while Cupkates specializes in homemade sweets. In evenings, Bin 702 wine bar and Oak & Ivy whiskey bar get popular. The shopping boutiques are made up art galleries, clothing stores, jewelers and even a barbershop. The shops of Container Park surround a unique interactive playground area that includes a Treehouse, NEOS Playworld and an area to build with giant foam blocks. As the centerpiece of the playground, the Treehouse is built on multiple levels and features a 33-foot slide. Naturally, the slide is made from a shipping container. The NEOS Playworld system is a highly interactive electronic light game. Players can choose from a variety of game settings, most of which involve following certain light patterns. At the rear of container park, guests will find a outdoor stage for concerts and performers. Live music is hosted on most evenings and is usually free. Occasionally, tickets are sold for when national acts perform. Other events include the free “Summer Movies in the Park” and “Magic Block Party.” Check the events page for more information. Container Park is easy to find, right on the corner of Fremont and 7th Street. Being within the Fremont East Entertainment District, it is very accessible to pedestrians. The park is often populated with local employees during lunch time. There is no parking lot specifically for Container Park; however, the public Llama Lot is about a block east and offers parking for $5.